Your system requires cleaning & optimization after a certain period. Here, your system starts showing diminishing performance over time due to extended usage. The primary reasons behind slow performing PC could be cluttered disk space, outdated software, hardware issues, malware attack, and many more. If your system is showing performance issues and you are wondered how to deal with it, then we are here to help you. In this article, we have discussed 6 best PC optimization software for Windows that will help you boost your PC performance significantly. Advanced System Optimizer: Advanced System Optimizer works seamlessly on Windows versions. 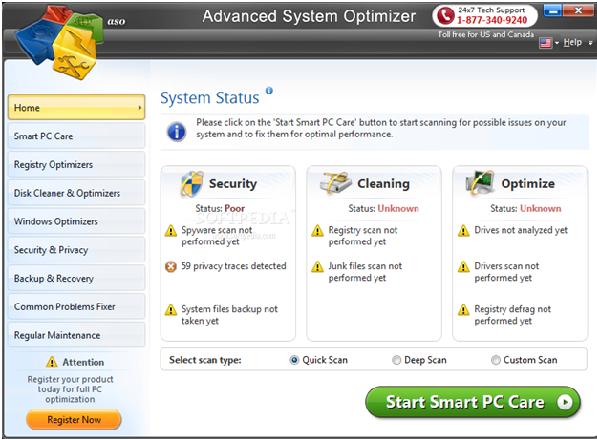 You can use this smart PC optimization software to boost your system performance significantly. 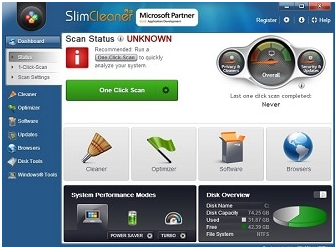 Working as a system cleaner tool, it helps you remove all old & obsolete junk files in a jiffy. It creates a system restore points to perform safe cleaning. Its game optimizer feature turns your system as a dedicated gaming machine. Here, it blocks various annoyances on your system including instant messaging, update notifications and more. Its driver updater function helps you update all your outdated drivers to reduce performance issues. It takes backup of your existing drivers before installing new ones for safe updating. This powerful tool also helps you protect your system from various malware threats working as a system protector. Its disk optimizer feature helps you defrag disks for more reliable & stable performance few fewer crashes and failures. 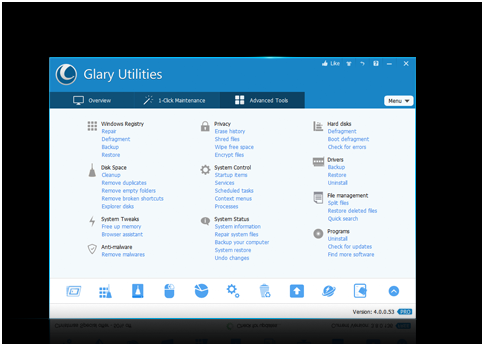 Glary Utilities Pro 5: Glary Utilities Pro offers one-stop solution all PC performance issues. It helps you boost your system speed & performance by fixing frustrating errors, freezes, and crashes. It features one-click functionality to make process easy & seamless. Its automated functions save a lot of your time & efforts. Its advanced features help you protect your system privacy & security and makes your PC faster and cleaner. You can use this smart solution not only to clean all junk files on your system, but it also helps you fix registry errors for better stability. It includes more than 20 premium tools in a single utility to make your system 800% faster. It is trusted by millions of users around the world. It is compatible with all Windows versions. PCKeeper: PCKeeper offers a state-of-the-art solution to keep your system fit. Here, you need to scan your system with PCKeeper and send scan results to your technical specialist. Under PCKeeper Live project, you will get customized fixes for your PC based on the problem detected. This one-stop PC cleaner & optimization solution keeps your PC in top-notch condition while protecting it from various threats both offline & online. It keeps your system safe from malware threats, viruses, security vulnerabilities and more. Its one button click feature helps you protect from all these threats effortlessly. You can use PCKeeper to remove unwanted toolbars, uncover suspicious software, configure your Firewall, eliminate system problems, remove spyware/malware/adware, protect your privacy, and more. 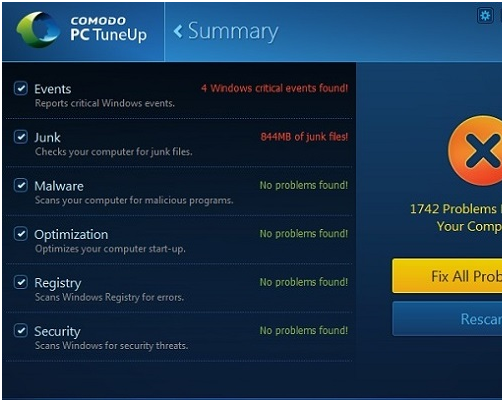 Comodo PC TuneUp: Use Comodo PC TuneUp to scan your PC and resolve problems that degrade performance. You can use this tool to analyze and fix numerous issues that occur while startup, shut down, running application, reading/writing to hard drive or at regular intervals. This smart solution helps you identify and delete files that are not needed on your PC. It includes unnecessary files that are created by Windows and multiple applications on your system including temporary files, logs files, and error reporting files. It helps you identify and disable all unneeded startup programs to boost boot time. It also helps you optimize Windows registry by defragmenting it. You can use this tool to find various registry issues related to file extensions, shared Dll’s, font locations, shared folders, help locations, startup locations, uninstall locations, menu order, and more. You can also use this tool to analyze Windows settings and restore default values when needed for better security. SlimwareSlimCleaner Utilities: Use SlimCleaner Utilities to tune up your system for better program response time. It helps you recover GBs of precious disks pace by removing unwanted junk files and unwanted programs. You can use this powerful tool to restore stability by cleaning out all junk. It offers one-click scan and manual cleaning & optimization features. You can use its performance boost mode to instantly speed up your PC & optimize it for better performance. Its optimize startup items feature helps you find and disable all unwanted startup programs to speed up your system boot process. 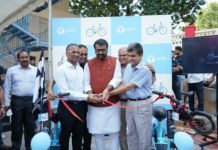 In other features, it offers power management mode, unwanted startup items alert, community ratings for software and startups, and more. 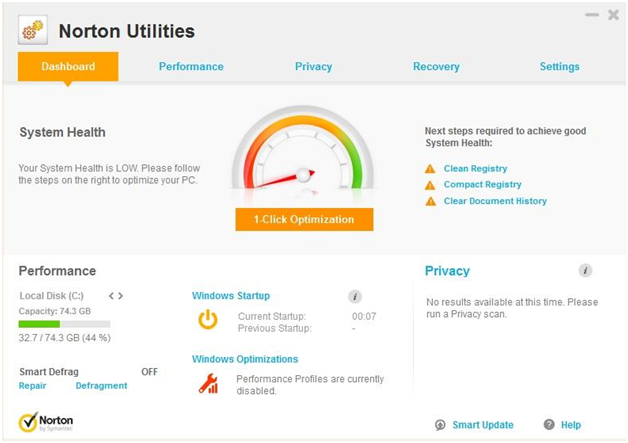 Norton Utilities Premium: Use Norton Utilities Premium to automatically optimize your system’s processing power, memory, and hard drive. It helps you run all high-demand apps & services in a seamless manner. 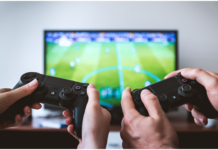 You can use this tool to enjoy gaming, editing and streaming services in a seamless manner. Using this tool, you can clean up and speed up your PC by finding and fixing multiple performance issues that cause slowdowns and crashes. You can use this tool to clean up unnecessary startup programs, free up disk space, safely dispose of personal documents, secure digital privacy by erasing browser file downloads, and more. It offers easy 1-click optimization with automated PC care for better performance. It also helps you keep your online activity and personal information private. Conclusion: Using best PC optimization tools for Windows is one of the safest & easiest solutions to deal with performance issues on your system. It helps you recover valuable disk space and optimize your PC for better performance. Furthermore, these smart tools work automatically to save your time and reduce manual efforts. Here, we have listed best PC optimization tools to help you optimize your system instantly. If you know more such PC optimization tools, then feel free to comment below. Metadata: The best PC optimization software for Windows offer an easiest & safest solution to help you optimize your PC for better performance. Let’s discuss some of these tools here.